This is a question many of us get asked at Buffer. We’re a fully remote in multiple time zones around the world, and unless you’ve experienced remote work in this way, it can be a bit tricky to wrap your head around. Specifically, this question of how to tell who’s actually working is one of the major curiosities. To put the question another way, perhaps what people are really asking is how trust functions in an environment that is entirely remote. This discussion is often sparked after large corporations decide against letting employees work remotely, like Yahoo, IBM, and Hewlett-Packard, citing that they needed their team to work better together. One of the unspoken messages here appears to be trust — or a lack of it. So how do we create trust when we can’t physically see our colleagues? Here’s exactly how we build trust in our remote team at Buffer, and a little more on why trust is so beneficial to organizations. There is a long list of positive impacts that trust has within an organization. One Harvard study looked at just how well employees at high-trust organizations perform and feel compared to employees at low-trust organizations, and the results are incredible. High-trust organizations are those with more empathy, collaboration, recognition of employees, vulnerability, and personal growth for everyone around. Low-trust organizations on the other hand, tend to have toxic cultures that people wouldn’t recommend a friend work at, and themselves plan on leaving. Being trusted to figure things out is also a big motivator: A 2014 Citigroup and LinkedIn survey found that nearly half of employees would give up a 20 percent raise for greater control over how they work including flexible work options like working from home. At Buffer not only are we a fully remote team operating in multiple timezones, we’re also a cross-cultural team. Being a cross-cultural team means that communication styles vary, there are different conventions around time, giving feedback, and disagreeing publicly. Here are five ways we build trust at Buffer that you’re welcome to grab and adapt in your own organization. Social connections at work are powerful in creating trust. Being remote means that we won’t bump into each other in the hall or get to know someone from another team while grabbing a cup of coffee. We need to intentionally create interactions within our team so that we can all get to know each other. Sharing tidbits about teammates: We send out a weekly internal newsletter that includes fun facts about teammates; sometimes we create team quizzes to see how much teammates know about each other. Personality tests: We all did personality tests together at our latest offsite retreat to share more about ourselves but also learn more about each other. Virtual meeting spaces: Spaces exist where people can meet up virtually, for instance in a #watercooler Slack channel or in our weekly Impromtu Hour chat via video. People can also get paired up in weekly calls with someone randomly chosen from throughout the company. Meeting in person: We aren’t remote all the time. Once a year we get together to work in-person for a full week on a team retreat. Being together gives us the opportunity to further strengthen the ties and relationships in our team. In the time between retreats, we’re experimenting with having smaller teams meet up in real life for a few days to have their own time to work and bond. We are very open and transparent about what’s happening at Buffer. Not only do we know each other’s salaries, but we also know what projects other teams are working on because they post progress reports throughout the cycle, we get regular updates from the leadership team in our quarterly all-hands, and we see monthly investors reports with financial updates. When communicating by email we BCC to specific internal lists (like marketing, finance, or the whole team) to be transparent. We also use a tool called Discourse to have conversations in the open there, too. This way anyone can catch up on discussions but doesn’t necessarily need to see every thread that is started. We know a lot of what is going on at Buffer, how the company is doing, and what everyone is working on. This level of transparency and sharing is definitely a building block in trust at Buffer and for other organizations. One study came to the conclusion that a leader’s level of positivity and transparency directly impacts the employee’s trust of that leader. Our whole team recently explored a book called The 5 Dysfunctions of a Team and a concept called artificial harmony. Artificial harmony is the second team dysfunction mentioned in the book. The first dysfunction, which all subsequent functions are based on, is absence of trust. 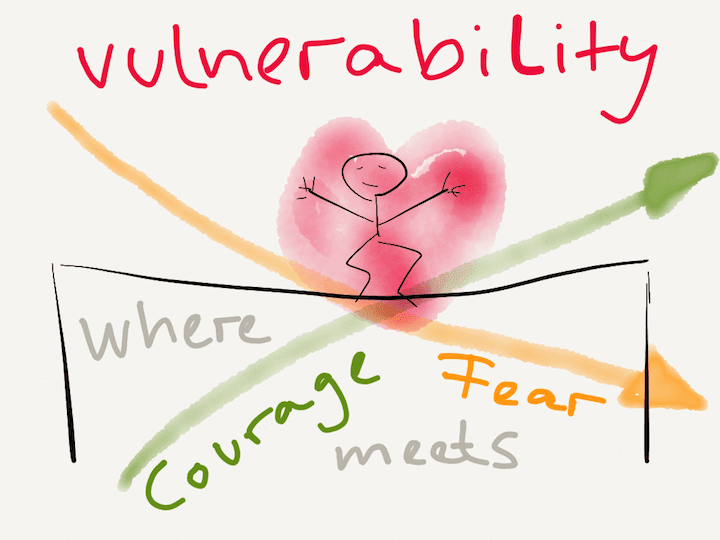 Being vulnerable is as simple (and terrifying) as admitting to needing help or owning up to a mistake. This isn’t easy, and we’ve been fortunate at Buffer to have our leadership team demonstrate vulnerability consistently, making it more likely that the rest of our team will follow suit. The Harvard study has a great section on self-improvement, which we’re big fans of already. This lines up perfectly with our value to focus on self-improvement. Recently, we took that value one step further and are encouraging employees at Buffer to continue their personal growth with a monthly learning and development stipend. How do we know that people are really working? To get back to the original question, we do really get a lot of questions from people who are curious as to whether people do work when they are at home, or maybe they get distracted by the many things going on around them. No one and no place is perfect, and remote work is not for everyone. Homes and offices can both be quite distracting. We do know that people at Buffer are definitely working, though. Everyone at Buffer has to deliver on their goals according to what needs each team has. Their output is a sign of their work and consistent output increases trust with managers. Hiring at Buffer is also done with an eye toward trust, autonomy, and responsibility. We can specifically look for those qualities in interviews by being conscious of if the interviewee shows up on time, are prepared, are comfortable communicating via email and visa, and whether they do their pre-hire projects in a timely manner. There’s a final element here: it is a huge privilege to be able to work remotely from any part of the world, and our team is super grateful for this opportunity. Thanks so much for giving this piece a read! Personally I had no idea that there were so many positive benefits to trust but it really makes so much sense when I thought about it. I’d love to continue the conversations in the comments. How do you build trust on your team? Whether it’s in person or remote, I’d love to know. What did you think of how we build trust? Could we be doing anything differently to build trust? Public Relations Director at Buffer and podcast co-host of The Science of Social Media, and MakeWorkWork. Obsessed with Brazilian Jiu Jitsu, reading, and drinking tea. I also think, that the greatest leader is one, who just trusts her/his followers and who assess them by the value they provide to her/his undertaking. In my opinion, the key sentence of this post is “Their output is a sign of their work [..]”. More companies should think like this! I build trust on my team by creating a people centric culture. If we want to be the best at our jobs, we need to be better people. I invest in my people (education, wellness, work-life balance). I love that Buffer actually knows what the word vulnerability means; I recently took Brené Brown’s Courage Works class and explored my own vulnerability and really got to know myself again. I highly recommend this course for anyone to really discover themselves again. Totally agree with you, Hailley! Great job! Thank you so much for reading, Ivan! I work remotely and much of what you wrote hit home. One of the best things my team did was go through The Five Behaviors of a Cohesive Team which is based on Lencioni’s work and combines it with a DiSC or AllTypes personality profile. We met in person for sessions on trust, conflict, commitment, accountability and results. They were amazing sessions. I learned so much about other team members and their expectations. We found holding each other accountable to be our greatest problem. We added a “gossip about me” section to our weekly check-in reports in the WeekDone tool to keep the personal sharing opportunity open.